Anthony Pettis (Pictured) learned a valuable lesson in his UFC debut against Clay Guida this past June. Although the former WEC lightweight champ has nearly every strike imaginable in his arsenal, Pettis was planted on his back for much of the scrap and wasn’t able to unload. 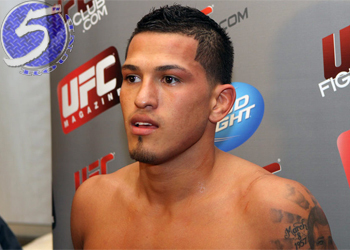 Understanding that winning is everything, Pettis changed up his game for Saturday’s UFC 136 bout against Jeremy Stephens. While the 24-year-old understands it wasn’t the most aesthetically appealing match he’s ever been involved with, a split decision win is still a win, nonetheless. “I’m happy that I won the victory, but for me it was like a mental loss,” Pettis told UFC.com. “I can perform way better than that. I really wanted to focus on my wrestling and my top game against Jeremy and show everyone that I am well-rounded and that I do have wrestling. I feel I did that, but I also think I could do better. Losing two straight inside the Octagon is never a good thing, particularly when you enter the big leagues with as much hype as Pettis did. “Showtime” knows that all of his fights can’t end with a spectacular cage-kick as when he beat Ben Henderson to capture the WEC crown, but he also doesn’t intend to permanently ground his aerial assault, either. It’s about becoming a complete mixed martial artist and he feels he took one step closer towards finding the happy medium.